Spring is clearly right around the corner. It’s touted on the cover of my March and April foodie mags, apparent in the changing selection at my Farmers’ Market and obvious with the quickly approaching spring planting season. However, it is most definitely not clear in the weather right now in Southern California. After an unseasonably warm January and February (we had weeks in the 80s), it has been quite cold (relative I know) as of late. This is made all the more unbearable by the expectation that spring and its warm, sunny days should be on the way. Baking bread is the most comforting thing I have found to take the chill off on these cold, weekend afternoons. The warmth of the oven does double time with my heater to give the house a nice toasty feeling, the smell that fills the kitchen as the bread is almost finished warms the senses and you just can’t beat the taste and feeling of freshly baked bread as you rip it apart with your hands and take down a whole loaf in one sitting. Since I received the book, Artisan Bread in Five Minutes a Day, for Christmas this year, a day hasn’t gone by that I don’t have bread dough sitting in my fridge. As soon as one batch is used up, I mix the next batch, right in the same container. I’ve recently gained the confidence to move on from the master recipe and start experimenting with what the rest of the book has to offer. I had some buttermilk to use up after making my cornbread madeleines and decided to put it to use with the buttermilk dough recipe in the book. After mixing and letting the dough rise, I took a look at the recipes that are recommended for the buttermilk bread. As soon as I saw it I knew, without a doubt, that I had to make the cinnamon raisin bread. The only thing better than fresh-baked bread to warm up a chilly afternoon is sweet, fresh-baked bread with a gooey center. Mix the water and buttermilk together, making sure that they are between 100 and 110 degrees. Whisk in the salt and sugar, then sprinkle the yeast on top, letting it develop (get a little foamy) for a few minutes. Pour the yeast mixture into a large bowl or your stand mixer and mix in all of the flour in one addition. You do not have to knead the bread, but use a wooden spoon (or dough hook if you’re using your stand mixer) to make sure the flour is thoroughly incorporated. Place the container in a warm place with a loose fitting cover and let rise for two hours. After the dough has risen you are ready to bake, but the authors recommend letting it chill in the fridge first to make the dough easier to work with. Butter a 9” x 4” bread pan and set aside. 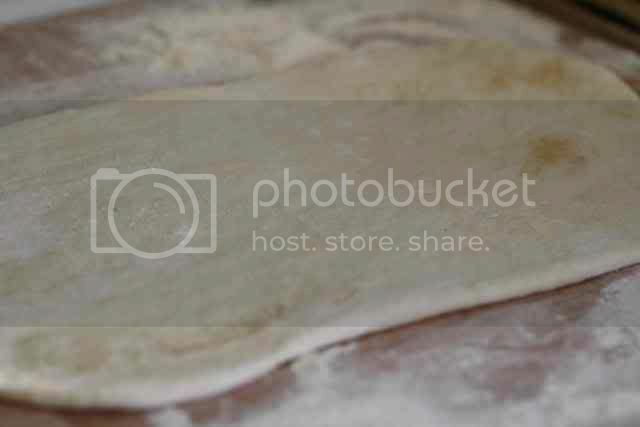 Roll out the dough (as shown below) to a rectangle approximately 18” long and as wide as the bread pan you are going to use is long (approximately 9”). If the dough is not stretching well, let it rest for 10 minutes and continue to roll. Mix the cinnamon, sugar and raisins together. 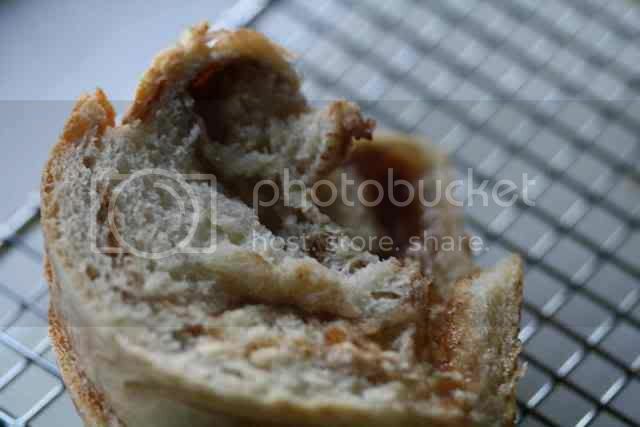 Brush the egg wash over the surface of dough and sprinkle the sugar and raisin mixture evenly over the egg wash. Roll the dough up, using a bit of egg wash to seal up the ends and the seam. 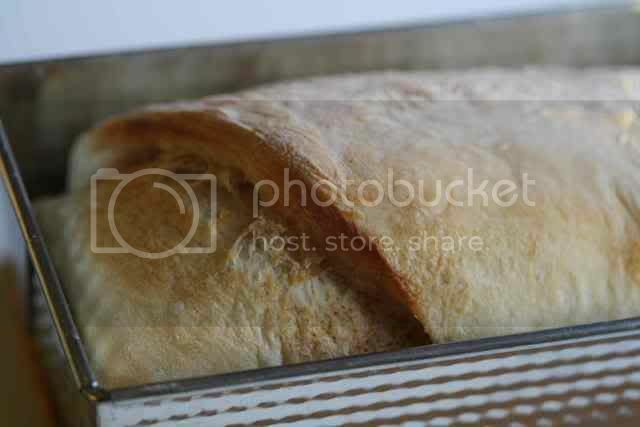 Place the roll in your bread pan and let sit in a warm place for at least an hour and as much as an hour and 45 minutes. 20 minutes before baking, heat your oven to 375 degrees. Bake the bread for 35 – 40 minutes until nice and golden on the outside. Let cool slightly before serving so the hot sugar mixture doesn't run out everywhere. The bread looks so light and fluffy! Great shots! My kids have been requesting cinnamon rolls, cinnamon toast, anything cinnamon so this will be a great one to try. I have never made fresh bread at home before (I say that while cowering in the corner), but it seems like it isn't as hard as it seems. This looks well worth any effort!! Oh yum. 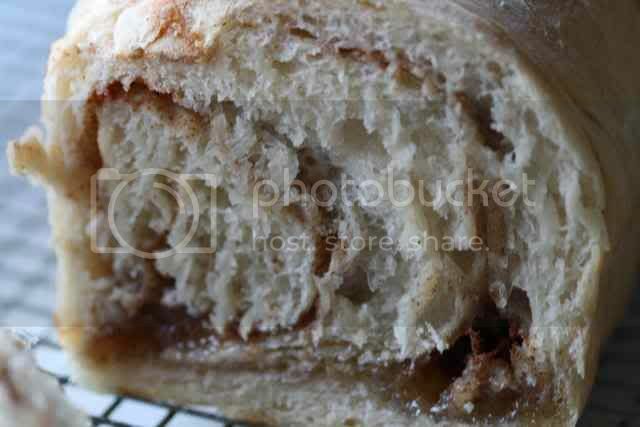 I love cinnamon bread! I bet it made the house smell so good! This is something I always wanted to bake! And yours look so delicious! Well done! I'll bet the aroma drove you wild as this loaf baked. Your photos are great. I completely agree with Mary above. Cinnamon and bread baking are the penultimate of great kitchen aromas! Looks great! Glad to hear you're gaining confidence in bread baking! I love the way a hot oven warms up my apartment... it makes it feel so cozy inside! That bread looks amazing -- so light and fluffy! I think I have to try this and soon. Both versions sound fantastic! The golden top looks lovely, then I see the cinnamony swirls and am convinced it's the kind of bread I'd definitely inhale :). I love what buttermilk does to bread dough and cakes. The cinnamon just takes this bread to another level. I'm going to try adding cocoa to the filling as well. Oh. man. This is good eats. We can smell it! Why did you use more sugar than the recipe called for. ok, I need to stop reading and eat some breakfast...this looks so yummy.